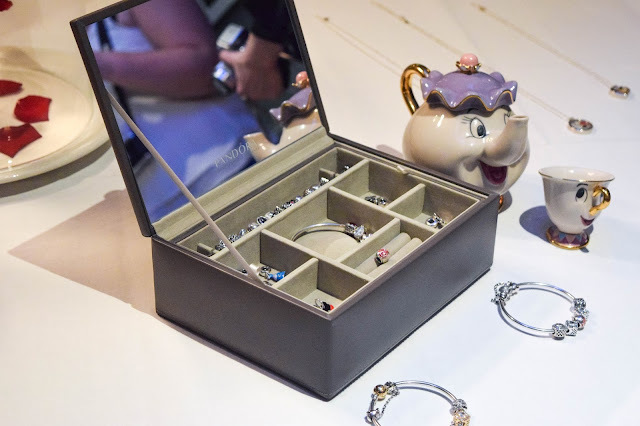 If you haven't seen my last post, I recently attended the launch of Pandora's Disney collection to the UK. 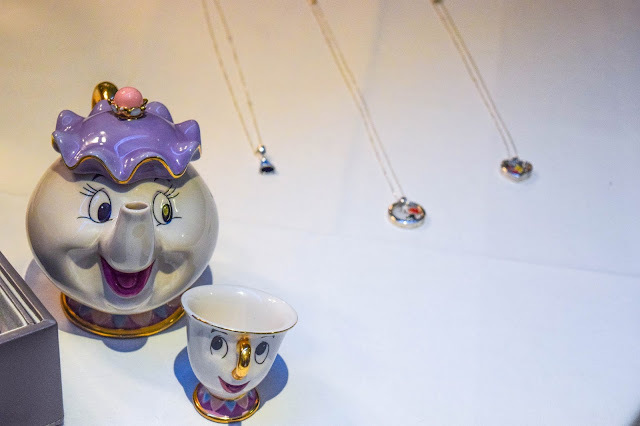 The collection is everything you wish it to be from charms to necklaces and Cinderella to Lilo & Stitch. 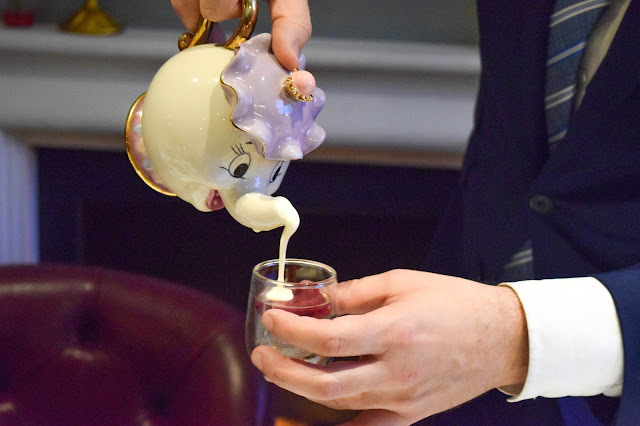 It's so beautiful and you can see it all for yourself in my last post here and also their website here. 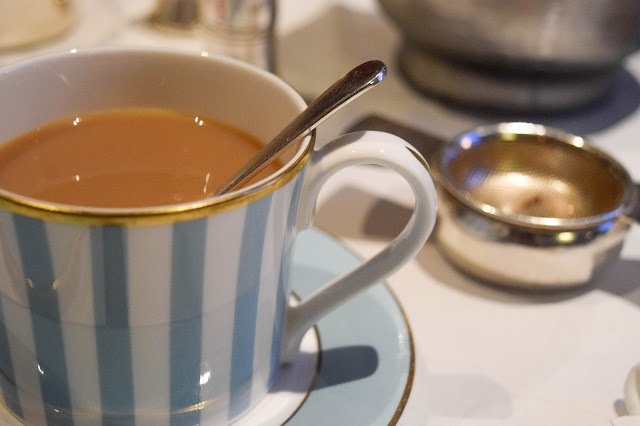 Today, I want to share with you photos and talk of my experienced at The Kensington Hotel where we had our own private room to indulge in the late afternoon tea. 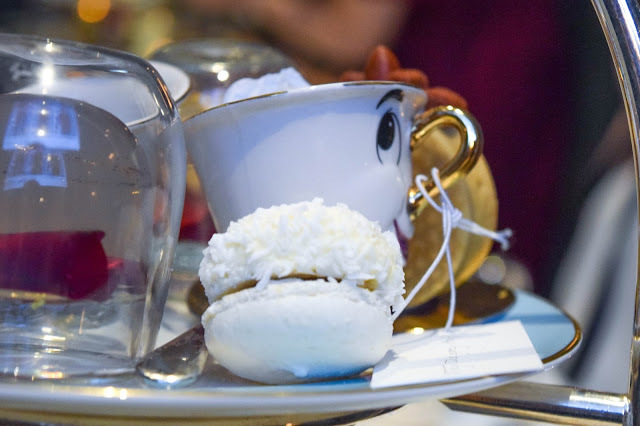 Upon entering the room, I was greeted by the Pandora team and a table filled with the gorgeous collection. It was so nice to have a second chance to see it up close and even more personal than before. 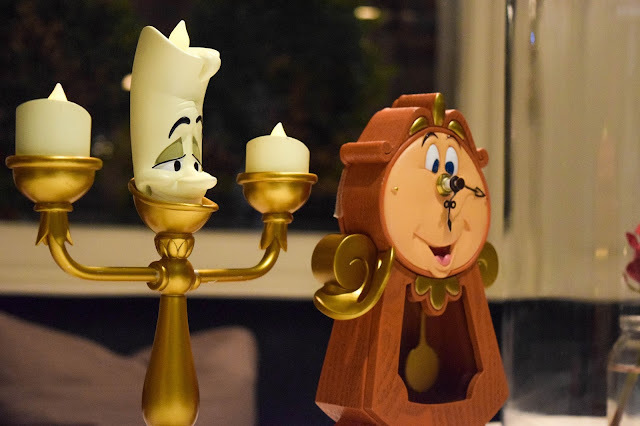 On the table was Lumiere and Cogsworth lighting up the table and keeping tabs on the time. I even spotted the infamous rose just behind them, falling petals and all. 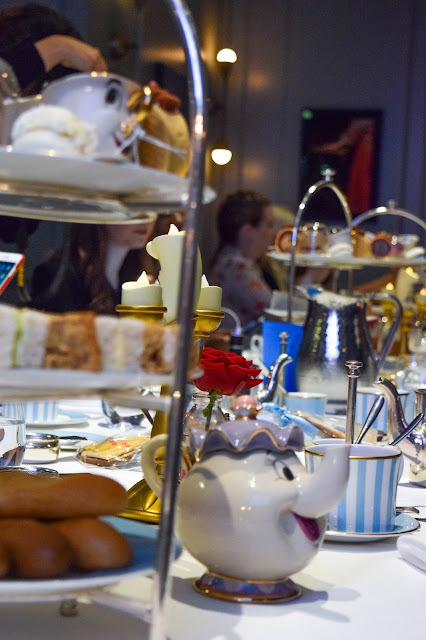 After finding Maria who I'd met up with and got to know at the last event, we caught up with a chat and sat down at the long table opposite Leah and Fran. It was lovely to finally see and talk to the faces behind their fantastic blogs and social media. 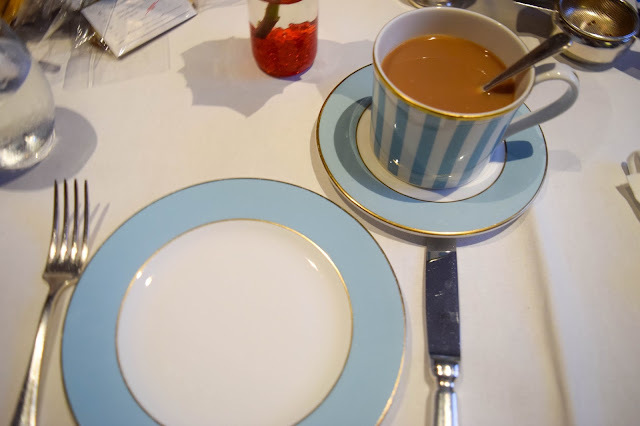 We started off with some tea in the prettiest china cups and admired the table decor. 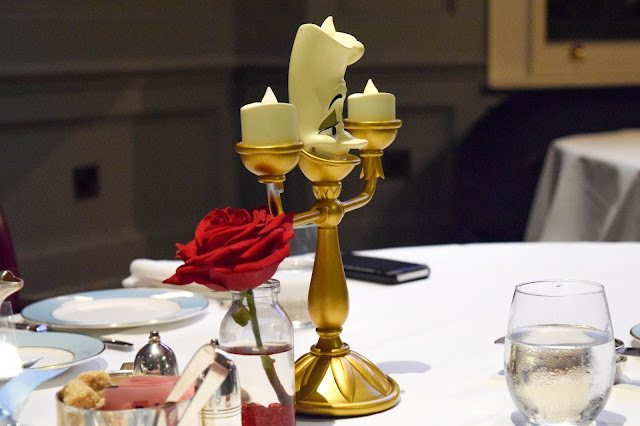 There were little Lumieres dotted around the table and the room and of course there was a rose wherever you looked. 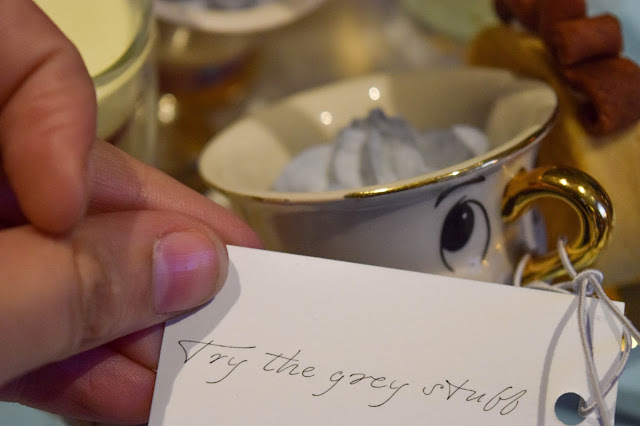 After warming up with some tea, we were given a plate with some amazing savouries. 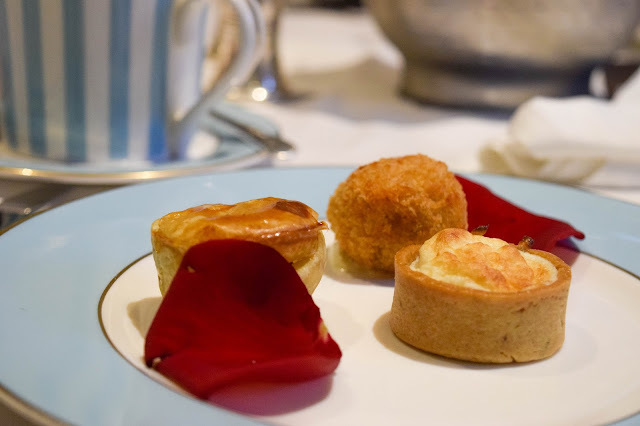 There was a little cheese souffle, a tiny beef arancini and a mini venison pie. 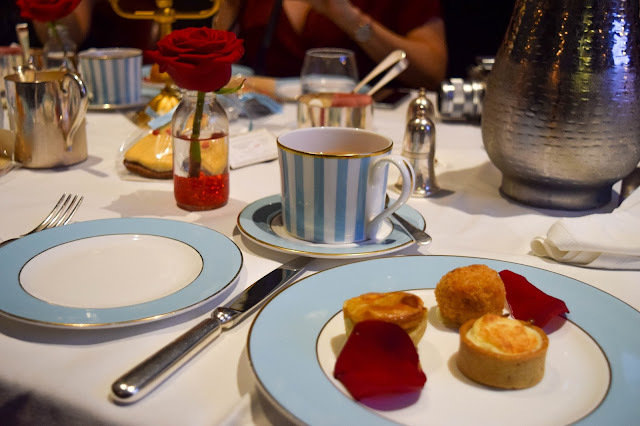 There were all gorgeous but the cheese souffle was definitely my favourite. I could have eaten twenty of those. 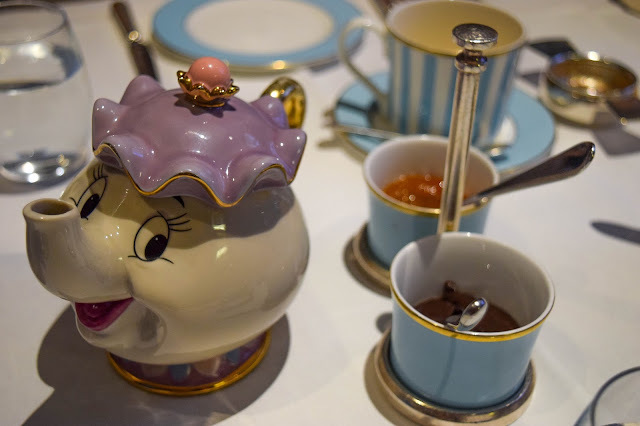 After some savouries, we started to see the sweet treats flood onto the tables starting with Mrs Potts filled with cream and some apricot preserve and chocolate to go with the brioche buns we'd soon be seeing. 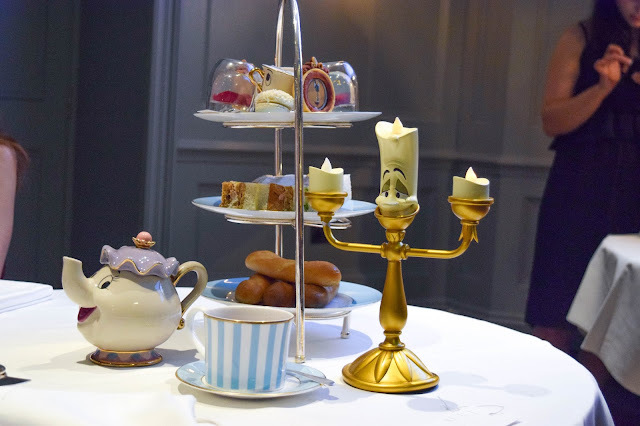 It wasn't long before they popped up on a classic 3 tier afternoon tea stand with sandwiches in 4 different fillings and the longed for Beauty and The Beast themed desserts. 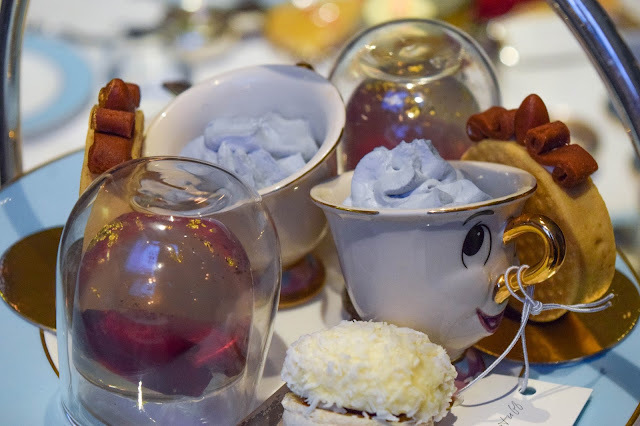 The desserts were just beautiful. 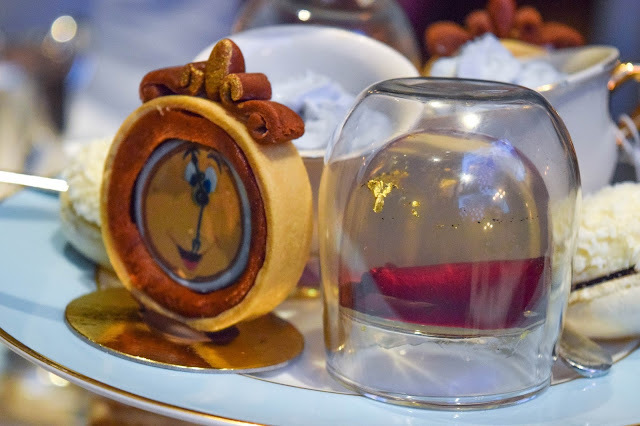 Cogsworth had been turned into the most delicious Chocolate Tart, The Grey Stuff from the Be Our Guest song was inside a little Chip cup and was actually a gorgeous white chocolate mousse. 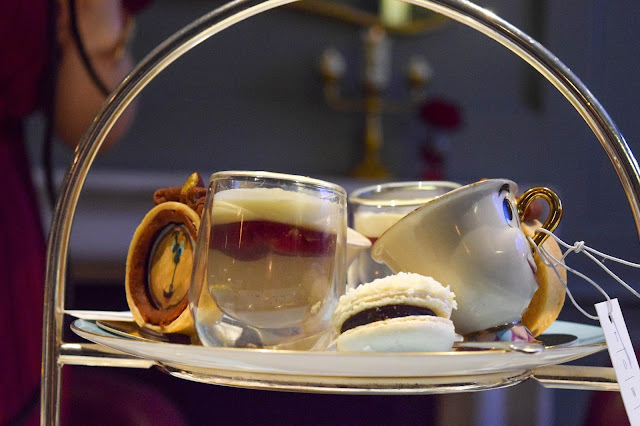 The macaroon represented the snowball fight between Belle and The Beast and tasted of chocolate and coconut and finally, the concept of the rose in a glass had been transformed into a vanilla and gold jelly with a rose petal preserved inside - best served with Mrs Potts's cream. 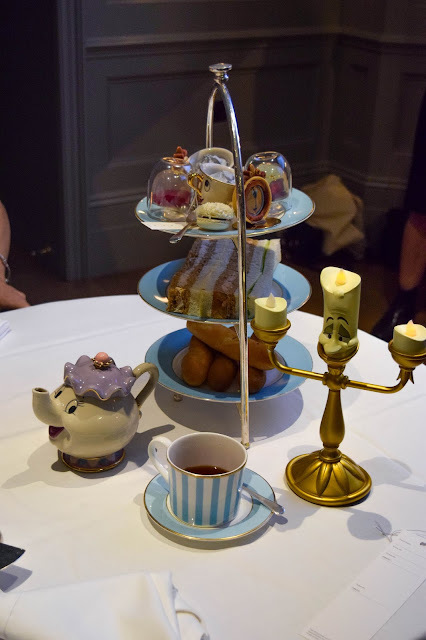 It was all very well thought out and it was all very delicious too. The evening was amazing. 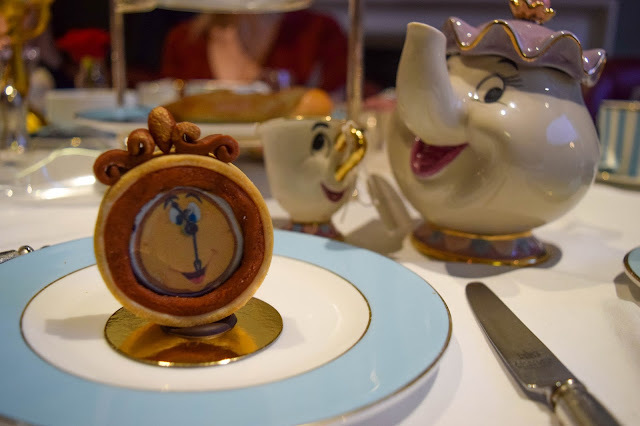 It was relaxing, I talked to some bloggers, I revisited the Pandora Disney collection and I ate some amazing food. 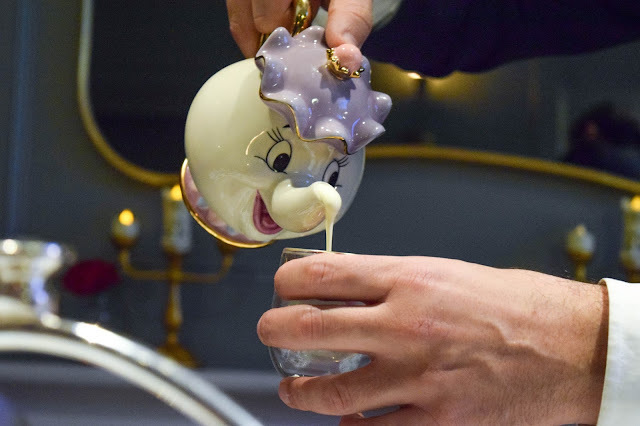 I adored the entire experience. It's fully booked until next year but I would absolutely recommend visiting if you're thinking about it. 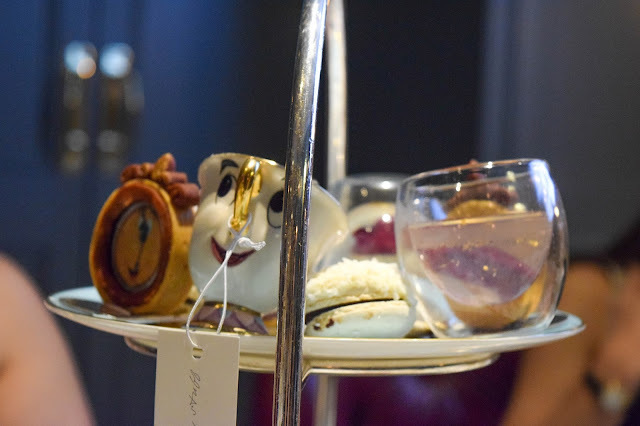 It was so worth it and I am tempted to go again, especially for the vanilla and gold jelly. 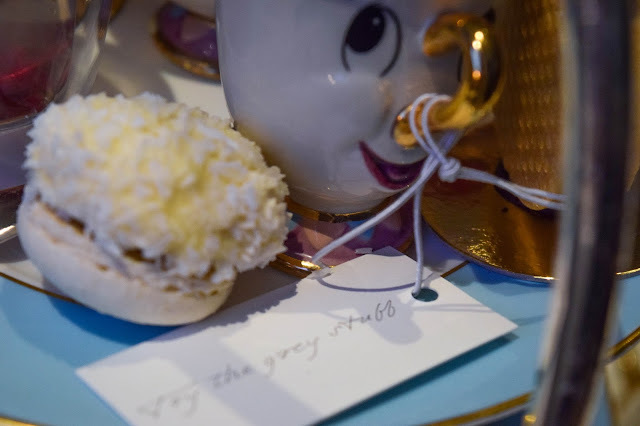 I think that was my favourite followed by the grey stuff! 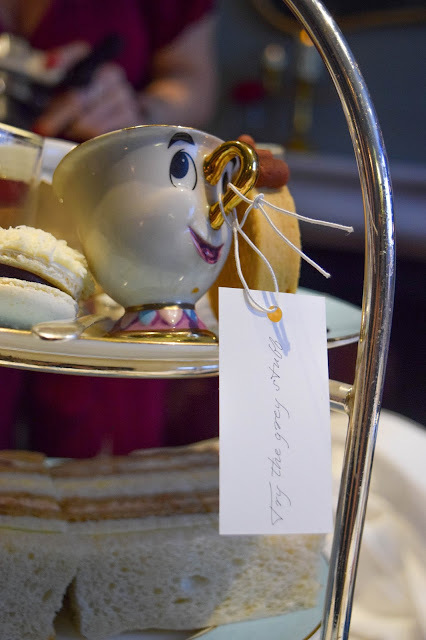 I'd like to take this opportunity to thank Pandora again for making some of my Disney dreams come true, not just in their new collection but by inviting me to come along to their launch event and the afternoon tea. 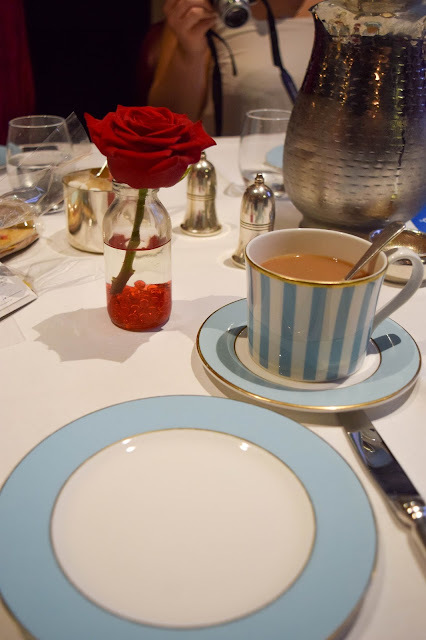 I had a magical time! 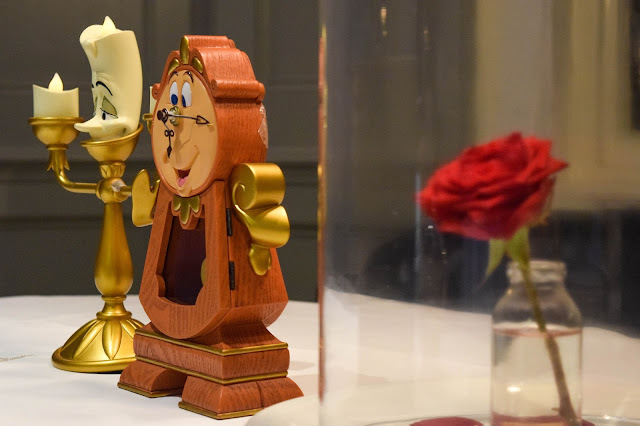 If you're interested in the Tale As Old As Time afternoon tea experience, you can book it here and if you're interested in Pandora's impressive Disney collection, you can find it here on my blog and here on their website to shop. 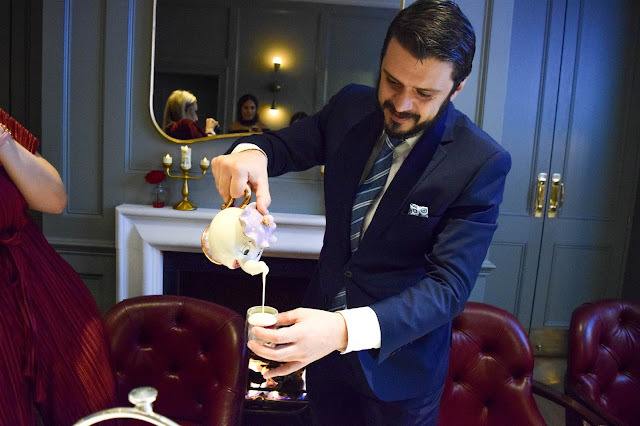 This event looks like so much fun, I'm loving your photos!